I’m helping out with a friends baby shower today, and I’m in charge of bringing the desserts. Yay! So I wanted to do some kind of cheesecake since I feel like cheesecake is kind of a dressier dessert then say just a normal cupcake. Plus, for some reason I am in a Oreo phase. I’ve been craving them like 24-7. Sad I know, but hey who doesn’t love Oreo’s, right? I love this recipe. It is actually surprisingly super simple cause you don’t have to cook a crust. I ended up adding 18 chopped Oreo’s instead of 12 cause I felt like 12 just wasn’t enough. 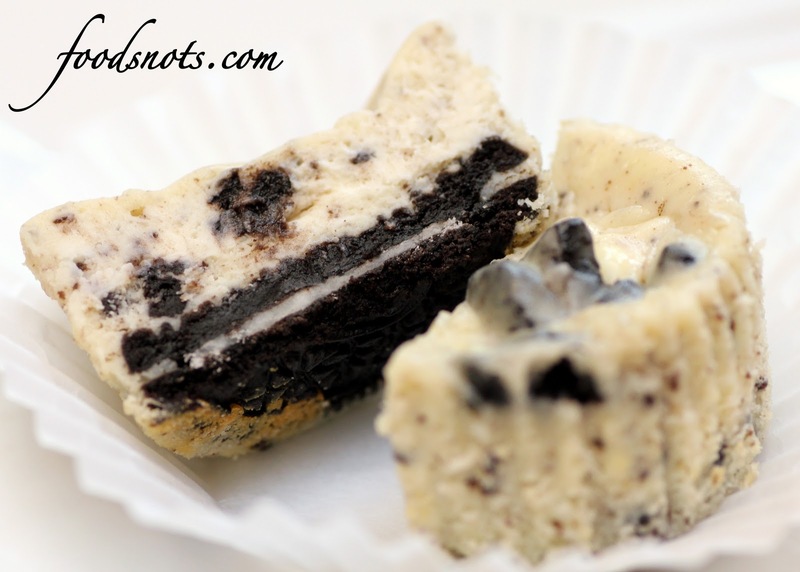 You could even do 20 just to give the cheesecake that cookies and cream flavor. So you are going to need to buy two packages of Oreo’s for this recipe. That was one thing I was trying to figure out in the grocery store that was a little frustrating, because trying to count the cookies through the package just wasn’t working. But in a nutshell, these mini cheesecakes taste almost exactly like a cookies and cream milkshake. So yummy! You just need to give it time in the refrigerator to set, so make then the night before. Enjoy!! Preheat oven to 275 degrees. Line standard muffin tins with paper liners. Place 1 whole cookie in the bottom of each lined cup. With an electric mixer on medium-high speed, beat cream cheese until smooth, scraping down sides of bowl as needed. Gradually add sugar, and beat until combined. Beat in vanilla. Drizzle in eggs, a bit at a time, beating to combine and scraping down sides of bowl as needed. Beat in sour cream and salt. Stir in chopped cookies by hand. Divide batter evenly among cookie-filled cups, filling each almost to the top. Bake, rotating tins halfway through, until filling is set, about 22 minutes. Transfer tins to wire racks to cool completely. Refrigerate (in tins) at least 4 hours (or up to overnight). Remove from tins just before serving.